Is it a blanket or a cloud? Our 100% cotton blanket for all seasons is made by Peacock Alley. 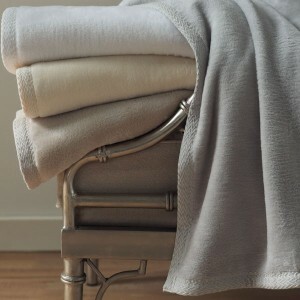 We guarantee you have never, ever experienced softness like this natural Egyptian cotton blanket. Densely woven for all-season warmth, the lightly textured surface easily passes for cashmere. But unlike cashmere, this blanket is sensibly priced and machine washable. Handmade in Portugal with 100% natural cotton, free from harmful chemicals. Sizes: Baby:36"x 50", Throw:51”x 71”, Twin:70"x 90", Queen:90"x 90", King:108"x 90". Super Soft 100% Cotton Baby Blanket, - "All Seasons"